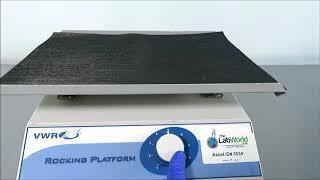 The VWR 100 Rocking Platform Rocker are ideal for end users looking to produce concise levels of agitation that gel and blotted membranes need. The VWR rockers have a built in adjustable rocking motion which allow for a gentle wave result which carry up and washes over gels and blotted membranes. These rocking platforms from VWR have the ability to maintain constant speed even if there’s any fluctuation in voltage. This VWR 100 Wave Rocker comes tested, backed with our warranty and ideal for labs looking to save money on general purpose lab equipment. Contact us today to learn more about our VWR Rocking Platform 100. This VWR Rocking Platform commonly known as a Wave Rocker has been tested and is ready to ship. If you have any questions about our VWR 100 Rocker please give us a call at 617-999-5746. Our inventory changes daily, so if you don't see something let us know when you call. If you have any used lab equipment for sale please send us a list. We offer several solutions to maximize your ROI including a hassle-free outright purchase among other asset management solutions.